The best-selling practical guide that shows you what to grow, how to grow it and when to grow it. Discover the taste of your own freshly grown vegetables! Covering many proven organic as well as conventional methods, this book will enable the complete novice to grow their own successfully. 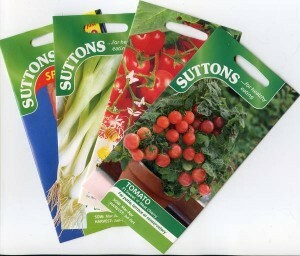 Thanks to Suttons Seeds we can offer you seeds worth £10.00 or more with this book, absolutely free. We’ve a wide range including Spring Onions, Lettuce, Rocket, Chilli & Sweet Peppers, Cucumber, Garlic Chives, Tomatoes (5 different varieties) and more. We’ll pick packets to at least the value of £10.00 to accompany your book and get you off to a good start. If you order 2 or 3 qualifying books together we will try to ensure you get different varieties and avoid duplicates as best we can. I bought this book and was really happy that I had. It isn’t full of glossy photos but it has lots of information and really tells you what you need to know to get growing. I would recommend this to anyone who wants no nonsense information. I am just starting growing veg and I have found this book to be very helpful and informative. It is written in plain (non gardening jargon) everyday language and gives you lots of little tips/hints. I feel that the information given is straight forward and practical and not full of stuff that I am unlikely to need. I am constantly picking it up and using it far more than many of my more expensive “thicker” books. Would recommend. Medwyn Williams, MBE FNVS – eleven times Gold medal winner at the Chelsea Flower Show, President of the National Vegetable Society.